New book, 30 pages. The Douglas Boston or Havoc is one major aircraft of WW2. Designed as a light bomber, it proved to be very versatile and was used with success in various roles over all theatre of operations. The introduction of the Boston into the RAAF’s inventory was a pure accident, being former Dutch aircraft. The usage was planned to be short but at the end, it lasted over two years and a half. 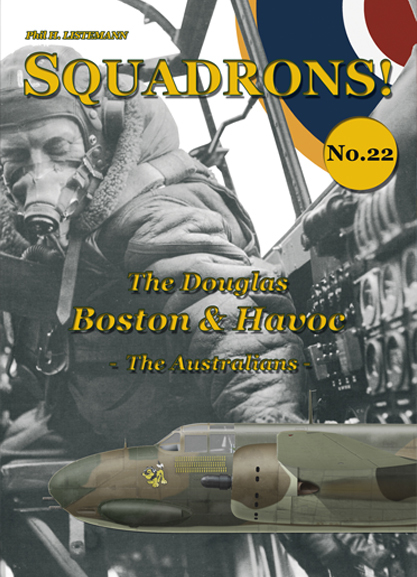 Only one RAAF squadron, No 22 , was equipped with the Boston, later completed with A-20s supplied directly by the US. The losses sustained by the 22 were high, but the Boston has the distinction of giving the he RAAF’s only Victoria Cross recipient of the Pacific war, Flight Lieutenant W.E. Newton. Thirty pages, close to twenty-five photographs and three colour profiles illustrate this book.